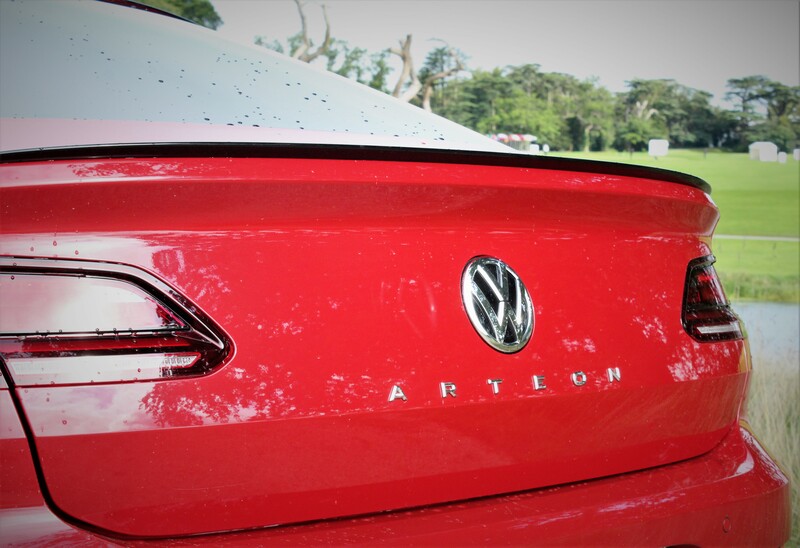 The Volkswagen Arteon is a model which I have admired since it was launched here last year. If I’m honest I felt like it didn’t receive the warm welcome it deserved for some reason or another. Maybe it was that some thought it was too much like a Passat inside or it was a CC rebranded but I for one felt it should have received more praise. 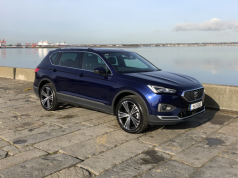 Having previously had the opportunity to test the diesel version I recently had the pleasure of experiencing the 2.0 litre petrol model to coincide with a family staycation. 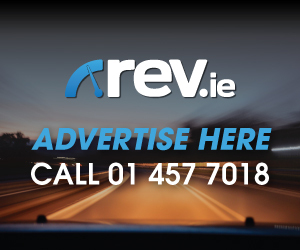 The addition of the “R-Line” trim throughout the Volkswagen range gives their models that little bit of extra appeal. 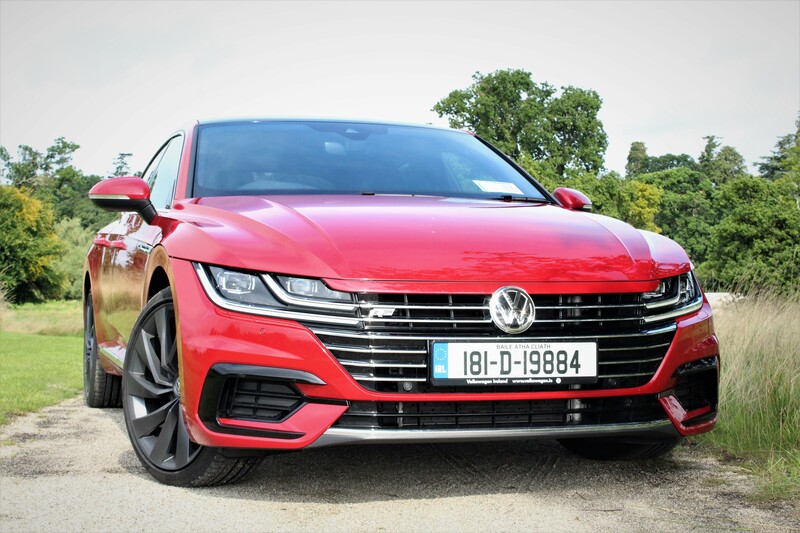 The Arteon is a good-looking car to start with but the addition of the “R-Line” trim just makes it stand out from the crowd that little bit more both inside and out. 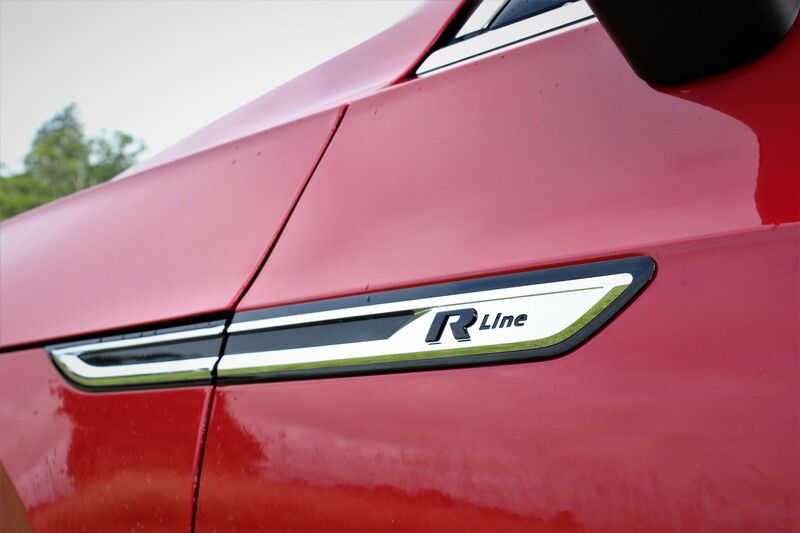 The “R-Line” spec adds 19-inch alloy wheels along with the leather R-Line multifunction steering wheel, R-Line specific sports seat coverings in alcantara and leather, rear privacy glass as well as R-Line bumpers and scuff plates, to name but a few of the standard items within the spec. 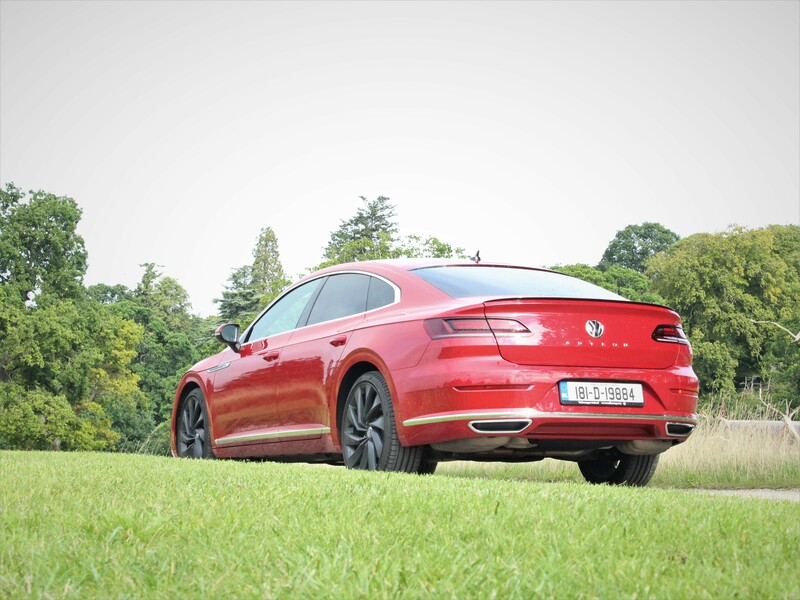 From the outside, the Arteon possesses a smart, sleek and sporty appearance with lines sweeping the full length from the front wings all the way back to the boot lid. 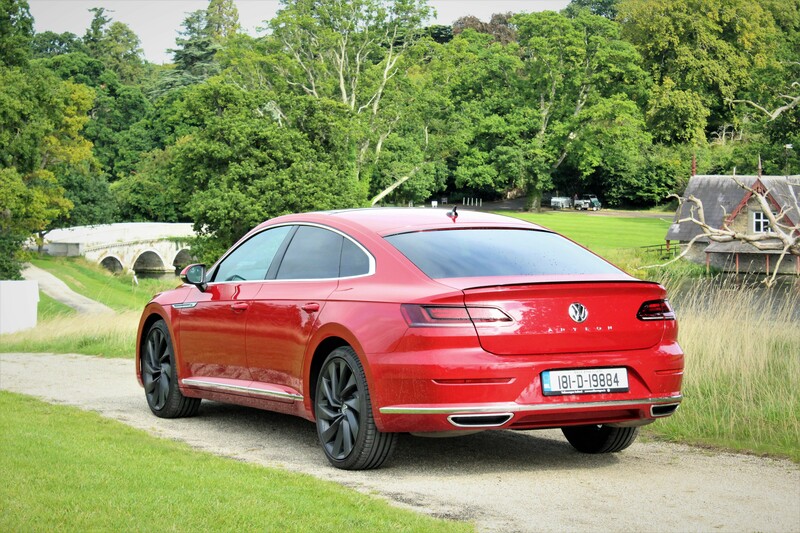 My test model also benefitted from the addition of 20-inch alloys which didn’t in any way look out of place on the Arteon. The sloping roofline of the Arteon is somewhat deceiving as rear seat passengers don’t have to sacrifice headroom to allow for exterior styling and body shape. As you sit into the Arteon you are welcomed by an abundance of space throughout the cabin. The front seats provide an excellent level of comfort too. Over the course of my test week I covered more than 800 kilometres and I never tired of sitting in the Arteon. The first thing which greets you as you sit into the Arteon is the 12.3-inch active info display which is common place in several Volkswagen models and replaces the analogue instrument cluster with a digital screen incorporating relevant driving information and selectable extras such as sat-nav, infotainment or driver assistance programmes. Moving to the centre of the dash, there are some familiar controls which have been taken from the VW Passat. Whilst the Arteon is aimed to be the flagship for the German brand, the interior trim does not seem inferior in any way. Everything is easy to use and functional. The addition of ambient lighting at night just adds a touch of class also. Space throughout the cabin is plentiful. Headroom is not compromised in the rear even with that sloping roof line. One of the biggest tests for any sports-back is trying to get children in and out of the rear seats without banging their heads. Thankfully there was plenty of clearance in the Arteon! Leg room in the rear is some of the best in its class. Boot space also stands at an impressive 563 litres which catered for all our holiday needs. If that isn’t enough for you, the 60/40 split rear seats can be folded down to extend the capacity to 1557 litres. On the road, the 2.0 TSI with 190hp paired with a seven-speed DSG automatic transmission performs brilliantly. Throttle response is excellent, and the addition of the steering mounted paddle shifts you can control gear changes yourself if you so desire. 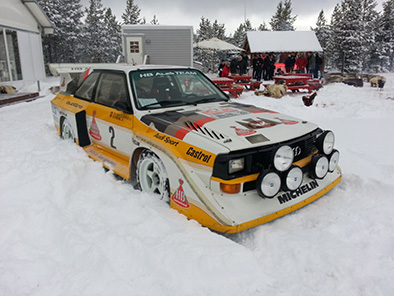 Personally, I tend to let the electronics look after the gear changes unless of course I’ve taken to the back roads and fancy a bit of a blow-out. 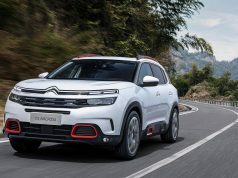 The 2.0 litre turbo charged petrol engine powers along and is as at home manoeuvring through city streets as it is on long motorway drives. Road noise is pretty non-existent. 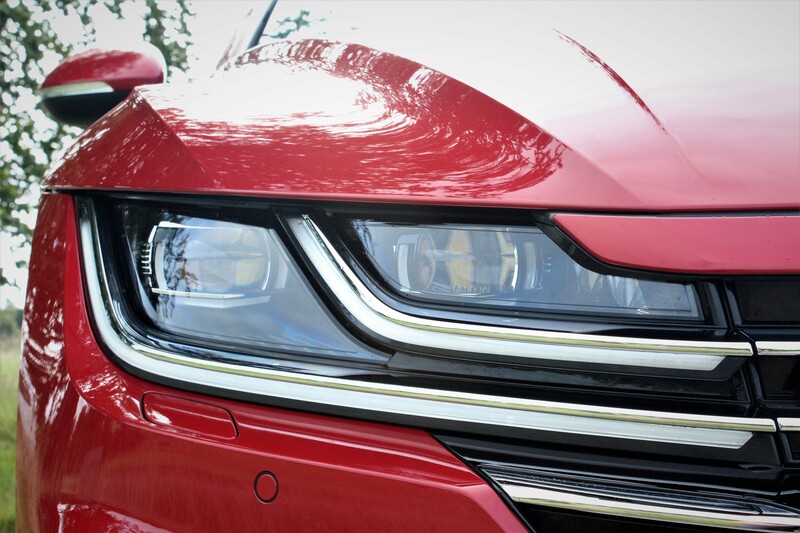 For a car of its size, the Arteon handles very well through corners offering great levels of reassurance as to its ability. 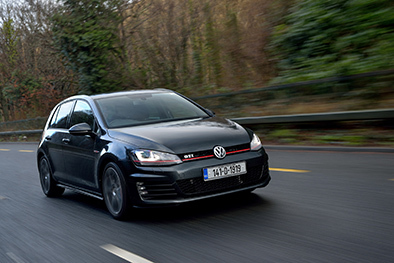 Don’t get me wrong, it won’t eat through corners like the Golf R, but it is perfectly competent even when pushed on that little bit. Comfort levels on the road are quite simply, superb. Overall, the Volkswagen Arteon in “R-Line” trim along with the 2.0 TSI and DSG combination works well. 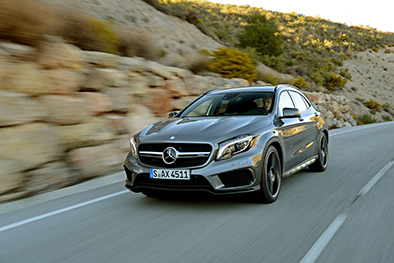 Sporty looks, excellent interior comfort and space and a very well performing engine make for a great mix. 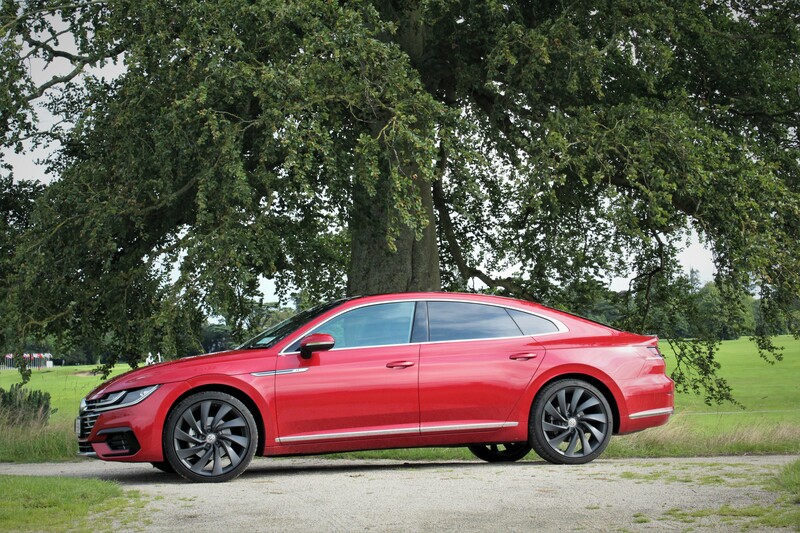 If you are in the market for something away from the norm and like the reassurance of German reliability, then the Arteon should not be overlooked and is at least worth a second glance.